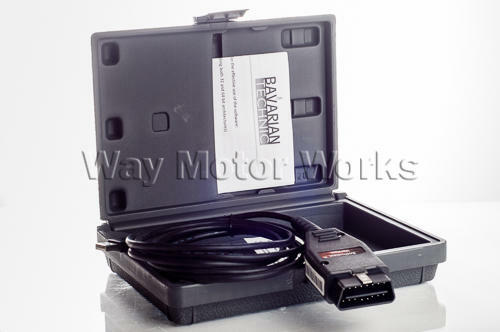 Bavarian Technic Basic Diagnostic Software for your MINI. Finally! Diagnostic software for BMWs and MINIs that Covers all new Minis, R50-R57! And it talks to all the subsystems, not just the OBD-II system. This software even lets you modify the service interval count and mileage! It can read and clear fault codes from all modules that "talk" via the diagnostic bus including the ABS system (airbag light). All normal OBD-II functions are supported as well. It will do real time data logging from modules that support it. This system is limited to One VIN. The software will read and reset normal OBD-II (emissions related) trouble codes that trigger the check engine light. The sofware will also display and log real time streaming data. This is my favorite function! The software can change the service count and remailing mileage for oil, front and rear brake pads, brake fluid and general service! Just tell the software the remaining percentage and presto, it's changed! Great if you do your own oil and brake jobs. No more dealer visits to reset the pesky air bag light! Great for those track rats that have aftermarket seats. Also, the fault codes will let you know what circuit is creating the fault condition for troubleshooting at home. The software can scan all of the subsystems of the car and report and clear all fault codes present. Great for the shade-tree mechanic that doesn't visit the dealer too often. Software can be updated for free with a simple web download. Cable firmware can be updated as well! I received the Bavarian Technic Basic Diagnostic proprietary cable and am more than happy! I installed a catless downpipe and of course got the check engine light. My generic code reader was showing different codes that were having me a bit worried. I was also able to reset my service interval after changing my brakes. The dealer wants $100 to do that. So thanks Way for this diagnostic tool.